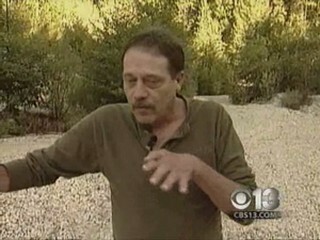 Sept 7, 2010 -- A local man says he came face-to-face with Bigfoot. He said he's getting ready to spot the creature again using balloons. A Grass Valley miner used to camp for up to five months every year -- just him and his tent, until one night he saw a creature so mysterious he doesn't rest so easy outdoors anymore. "It just wandered left and right down the canyon here. Then it went 30 feet from car. It was close enough I could reach through the tent and touch it. My heart beating so hard I could hear it," said William Barnes. William says he will never be the same after his encounter. This gold miner was camping near Greenhorn Creek in July 1997, when at 2 a.m., he came face to face with Bigfoot. "It took me 4 years to mention it to the first person -- one of my best friends," said William. Once William opened up about his heart-stopping sighting with the 500-pound mysterious ape, he found out he was not alone. "About 80 percent don't report it because they get ridiculed," said William. But William says 16 people in the area told him they've seen the same monstrous mystery. If there are all these sightings, where are the footprints? William hasn't seen any in Nevada County. He just says look on the ground. William will set out on a road less traveled, planning to spend a year and $200,000 hunting for the Sasquatch from the sky. "I want to film it in the wild not for one minute not for five minutes, but 45 minutes," said William. He plans to fly 35-foot helium balloons over 13 different states where sightings were reported watching and recording with thermal imaging cameras. "If you're breathing at nighttime I can see you," said William. He says Project Falcon, as he calls it, will prove to the world his encounter was real. "I have no doubt what I saw; no doubt I guarantee I know they exist," said William. William is paralyzed from his knees down. It's not going to be an easy mission, but he says he'll do what it takes to capture this creature in its natural state. And then maybe he'll be able to rest at night. He's still waiting for the balloons to be built. He's also waiting for funding from groups as far away as Russia. Once Project Falcon is ready to set sail, he says he'll spend every day for one full year looking for a big ape.